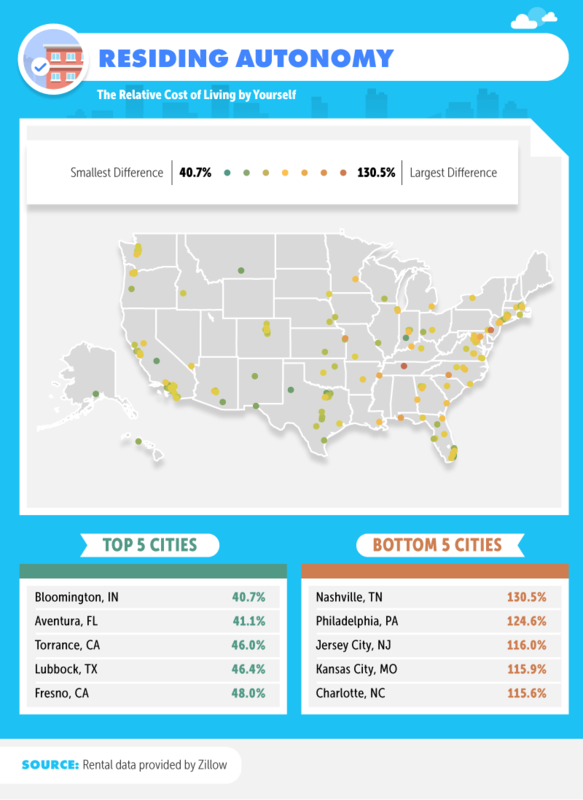 Learn which cities and states offer the best value for people who want to live alone. We compared living with a roommate or two, versus living by yourself. Imagine if you lived alone. No extra dishes in the sink, no one to leave the lights on when they’re not home, and no one to argue with over the TV channel at night. The truth is millions of Americans live alone. In fact, across the U.S., 1 in 4 households consist of just one person, a figure that continues to rise. One of the only real downsides to living alone (beyond the lack of company) might be the price. However, some places are undoubtedly better suited for single residences. Plus, you may only be spending slightly more than if you opted to live with roommates. Using rental listings on Zillow, we broke down the cities and states that offer the best value for people who want to live alone, compared to living with a roommate or two. Continue reading to see what we discovered. *Percentage increase in rent represents an average of the cost difference between living in a one bedroom vs. a two or three bedroom, where rent is split among residents. If you think finding the best deal on living alone means moving out to the middle of nowhere, think again. To find the best bang for your buck, we looked at the percentage increase in cost to live alone, versus living with one or two roommates. Our research found that the smallest percentage increase in living alone was in Bloomington, Indiana. With less than a 41 percent cost difference between living solo and finding a roommate, there are certainly perks to living in Bloomington. This city has scenic trails and outdoor recreation on one side and happens to be one of the best places in the country for entrepreneurs. It also ranks as one of the best foodie cities in the country. Its food, family-friendly activities, and outdoor culture offer something for just about anyone. Other cities to consider if you’re looking to live on your own? Aventura, Florida (41.1 percent), Torrance, California (46 percent), and Lubbock, Texas (48 percent). 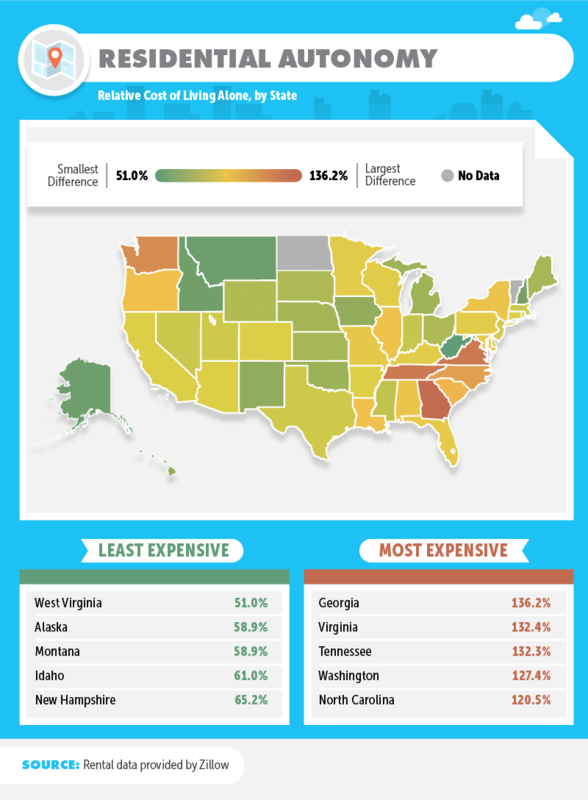 Some states offer a better value than others for Americans who want to live alone. By comparing the cost of living alone to the cost of living with a roommate, we determined which states offered the best options for people looking to find a space for just themselves. West Virginia and Alaska came out on top for offering the best savings for people living stag (51 and nearly 59 percent, respectively). Even better, finding the best value in Alaska could also include some of the best views in the world, diverse food options, and a rich array of cultures. And, if you prefer your weather just a touch warmer, Montana came in just behind with a 58.9 percent cost increase between living alone and with another person. With the mountains, prairies, and thriving cities, there is plenty to do and see around the state. Idaho and New Hampshire also ranked among the top five states for Americans looking to find the best deals for living solo. However, states with the highest percentage increase in cost to live alone included Georgia, Virginia, and Tennessee – where the difference between living alone and with a roommate was over 132 percent. How much can you really expect to pay for a one-bedroom apartment in cities with the least expensive costs? If your budget happens to be roughly $1,800 a month, there are quite a few options for you to consider. In Laguna Niguel, California, the average cost of a one-bedroom apartment is $1,817 per month. On the East Coast, Waltham, Massachusetts ($1,844), Stamford, Connecticut ($1,856), Aliso Viejo, California ($1,866), and Seattle, Washington ($1,872), offer a similar value for people looking to live on their own. And if you happen to like beaches and sunshine, a one-bedroom apartment in Miami might only set you back $1,924. However, there are a few cities you might want to steer clear of. The most expensive one-bedroom apartments in the U.S. were in San Francisco, California, at an average of $3,296 a month. 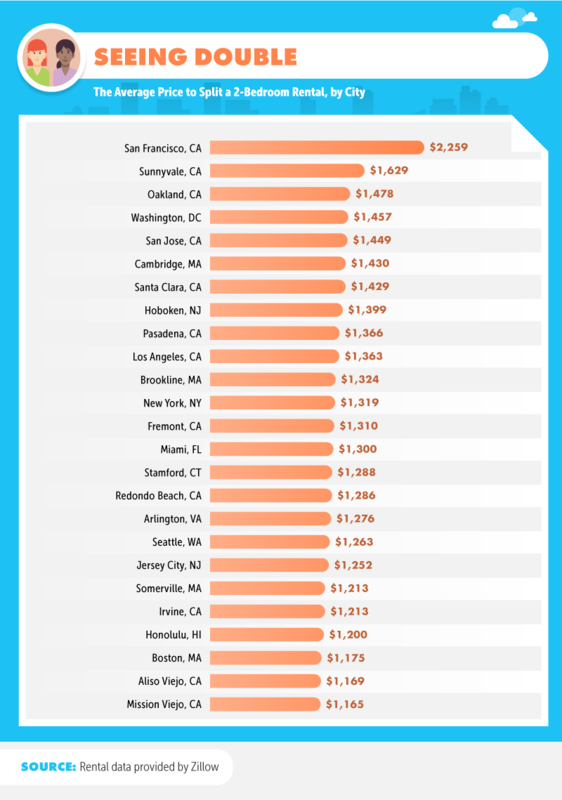 An apartment in Sunnyvale would cost you $2,557, and if you were looking for a one-bedroom in San Jose, you’d be looking at paying $2,428 on average. Willing to consider finding a roommate to bring your cost of living down? Our study found three options under $1,200 a month per person if you split the rent two ways. At only $1,165 a month, Mission Viejo, California, offers the best value overall when looking for a two-bedroom option. Other choices for nearly the same cost? Aliso Viejo, California, Boston, Massachusetts, and Honolulu, Hawaii – all under $1,200 a month per person, on average. While bringing in a second person can help lower the cost you’d both pay to live, it doesn’t do much to change the top three most expensive cities for a two-bedroom apartment. 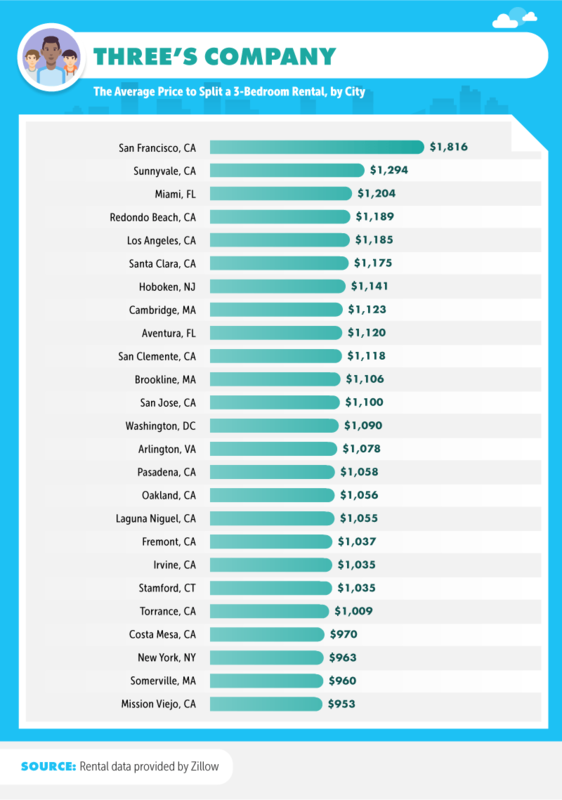 San Francisco ($2,259) is still the priciest, followed by Sunnyvale at roughly $1,629 per person. To keep with the California trend, Oakland beat out Washington, D.C., as the third most expensive city in the U.S. for a two-bedroom apartment split two ways. Having two roommates can save you money – but it won’t be much of a difference over just having one. Our research found four cities that averaged under $1,000 per person for rent in a three-bedroom apartment. In Mission Viejo, California, the lowest rent value was $953 per person, and just a few dollars higher to live in Somerville, Massachusetts. New York City, as well as Costa Mesa, and Torrance, California, also ranked as cities with the lowest monthly cost for three people living together. Cities where rent is still the highest even with an extra roommate? The top two came from California – San Francisco and Sunnyvale. 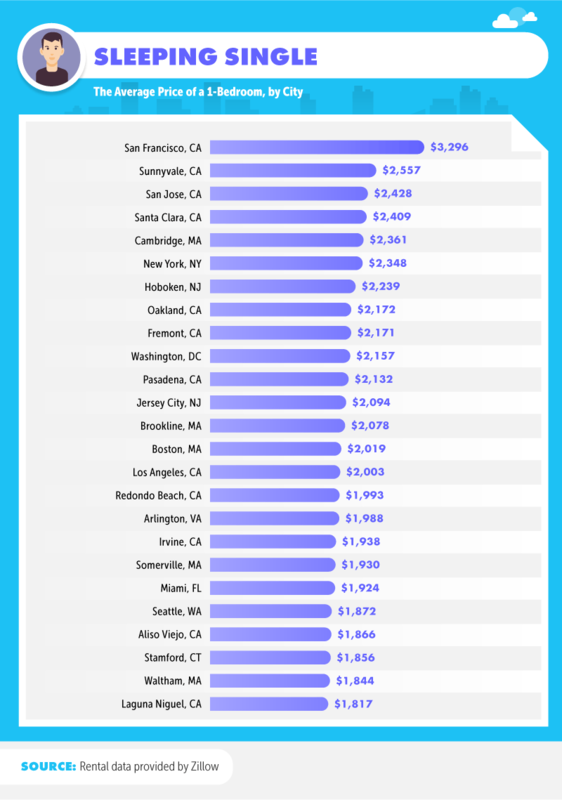 Rent per person in San Francisco was the highest, averaging $1,816 for a three-bedroom apartment. While rent in Los Angeles was also high, adding an extra roommate certainly helped bring the cost down. A one-bedroom apartment averaged $2,003, compared to $1,185 when split between three people. If saving money through additional roommates isn’t your thing, it may still help to know which parts of the country have the lowest average costs for a one-bedroom apartment. Dayton, Ohio, Killeen, Texas, and Springfield, Missouri, all averaged less than $500 a month for a one-bedroom apartment. 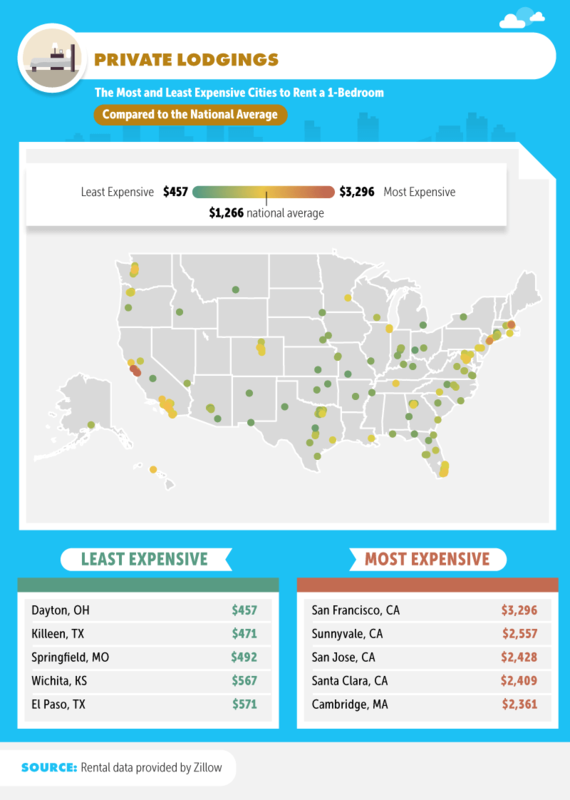 Some cities in the U.S. don’t even come close to costs like these, though. In northern California, a one-bedroom apartment in San Francisco could cost nearly $3,300 a month. Still, if you have your heart set on a better price, there are some more affordable options you should consider. A one-bedroom apartment in Wichita, Kansas, averaged $567, followed by $571 in El Paso, Texas. Living alone can have its perks. Be as clean (or as messy) as you want all the time. Keep things quiet, or turn up the volume. Never worry about someone else eating the food you bought. However, if the cost of living alone where you currently are seems a little daunting, consider relocating to a number of cities and states that are perfect for going solo. Of course, when the only person paying the bills is you, it’s more important than ever to make sure your financial savvy is top-notch. At CreditLoan, we help you get the most out of your credit card options, provide tips and tricks on how to manage your money, and include resources for Americans looking to turn their credit history around. Don't let a bad credit score stand between you and your goals. We looked at Zillow data for rental ads from July 2016 to July 2017 on one-bedroom rentals, as well as two and three-bedroom rentals. We then took one-bedroom rentals and compared them to the cost of splitting a 2-bedroom or 3-bedroom with roomates to find the percent difference between them. Sometimes it’s worth paying more for the comfort of living by yourself. If you found our analysis interesting, feel free to share for noncommercial purposes and link back to the authors of the research.